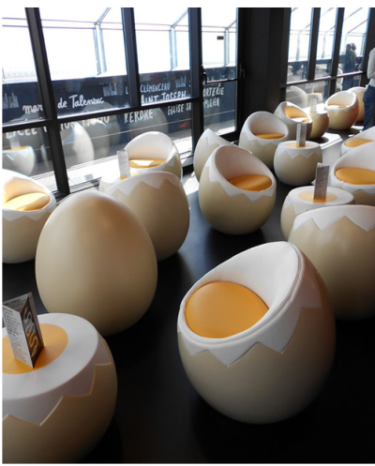 A sense of whimsy decorates a bar called “Le Nid” (meaning the nest) in Nantes, France. Speaking off eggs, this is the most random (yet awesome) food trick — watch how you can separate eggs with a plastic bottle. We tried it ourselves. Food has always been part of diplomacy, but now American chefs are being tapped by the State Department as official culinary ambassadors. "The wide-ranging effort creates an American Chef Corps, a network of culinary leaders who could be deployed to promote U.S. cooking and agricultural products abroad." In a spirit of goodwill towards the American people, and beer enthusiasts everywhere, The White House has realeased its much-aniticpated home brewing recipes (complete with a video). Cheers! Smithsonian magazine takes a visual tour through the history of the lunchbox, from 19th tins to mid-20th century classics, like the Partridge Family and Lost in Space. There's nothing more mid-century than nuclear obsession. Cold War–Era Science Shows Beer Will Survive a Nuclear Apocalypse "In a world that had seen the potential of nuclear weaponry and that faced the threat of disaster as America and the U.S.S.R descended into the Cold War, a hierarchy developed around facts society might need to know about nuclear explosions. Number 32.2a on that list, apparently, was understanding 'The Effect of Nuclear Explosions on Commercially Packaged Beverages.' Specifically, beer. And soft drinks." Now lunch room politics is about more than choosing between Holly Hobby and Star Wars. In suburban Pittsburgh, students are taking to twitter to protest their low quality school food. Urbanization Puts Farms In Africa's Cities At Risk "The survey — which is the first of its kind — looked at city farming in 31 countries, where more than half of Africa's urban population lives. The authors say that governments need to integrate urban farming into city planning, or else the cities may lose one of their best sources of food."